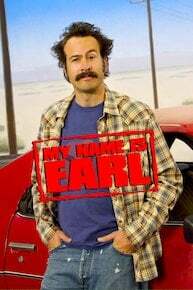 My Name is Earl is a comedy that follows title character Earl Hickey, played by well known actor Jason Lee. Earl is a two bit con artist, who is generally disliked by almost everyone who knows him or has ever dealt with him. Earl only decides to change his scam artist ways after he wins the lottery and then is hit by a car while celebrating his good fortune. This accident causes Earl to lose the winning lottery ticket before claiming his prize. Earl decides, while in the hospital recovering from his injuries, that karma and his previous misdeeds have caused him to lose the ticket. He then makes a list of all the wrongs he's ever done to people, in order to hopefully improve his karma and his lot in life. After successfully scratching the first person off of his list, Earl finds his lost $100,000 lottery ticket. Earl then decides to finish the rest of his list and fix all of the bad things he's done to his friends, family and random strangers during his life of crime. Earl is helped in his goal to finish his list and mend his karma by a cast of goof ball characters who live with him in Camden County. One of the main people who helps and hurts Earl with the completion of his list is Earl's dimwitted, but sweet brother Randy Hickey (played by Ethan Suplee). Randy is the only one in Earl's family who still talks to him and was his main partner in crime in the old days. Earl also is helped in completing his list by his trash talking ex-wife Joy Turner (played by Jaime Pressly), her extremely smart husband Darnell Turner (played by Eddie Steeples) who's in witness protection and the maid at the motel where Randy and Earl live Catalina (played by Nadine Velazquez). As he completes his list, Earl realizes more and more that it feels good to do good things. Earl winds up running through most of the money that he won in the lottery, but he also ends up mending his relationships with all the people who knew, and mostly hated, the old Earl Hickey. Earl searches for Dodge's dad, despite Joy's protests. The mystery of the disappearance of the former Crab Shack owner is finally resolved. Part 1 of 2. The news show "Inside Probe" arrives in Camden to investigate the vanishing of Crab Shack owner Ernie Belcher. The story finally airs eight years later---with Earl and Randy emerging as the suspects. Guest stars include Geraldo Rivera and racer Michael Waltrip. Hulu Plus subscription required. Learn MoreThe locals gather round the TV at the Crab Shack as Geraldo Rivera and Inside Probe investigate the disappearance of its owner, Ernie Belcher. Mike Waltrip guest stars. Earl atones for bullying a kid at school, while Randy uses steroids to overcome his own bully: Joy. Earl helps Randy find his first love, Pinky. Young Dodge's desire to attend space camp prompts Earl to reflect on the blast he and Randy had as kids at Chaz Dalton's Space Academy. Earl then sets out to reconnect with the heroic Chaz (Curtis Armstrong). Meanwhile, Darnell tries to help Joy click with new friends on the Internet. Danny Glover guest stars as Darnell's father who comes looking for him in Camden only to raise Earl and Randy's suspicions. However, a family reunion leads to father and son partaking in one last undercover mission. When Mr. Turtle returns back to Earl, he wants to bring him back to Darnell.Meanwhile, Joy and Darnell have to adapt to a new lifestyle of their cover identities. In the aftermath of having his cover blown, Darnell must pack up and leave Camden. Meanwhile, Earl, Randy and Catalina discover a devastating truth within the post office. Joy steals Randy's audition for Erik Estrada's reality show "Estrada or Nada", but her public appearance has consequences for Darnell. A young Earl gets his heart broken by the babysitter and swears revenge on her and her boyfriend. Now, Earl is older and wiser, so he decides to cross them off his list, but it may have terrible repercussions for Randy. Meanwhile, Joy loses Darnell's pet turtle. Earl crosses a conned man off his list for a scam he and Joy started many years ago. Then he finds out that Joy has been continuing the scam behind his back along with some of her friend's. Earl remembers a list item he crossed off while reading to the children of Camden County. While going down memory lane, Earl recalls that his old friend Raynard kept company with a raccoon while living in the great outdoors. Earl loses his list when tornadoes blow through Camden County. Earl remembers his first wedding anniversary. Earl needs to make up for a passed on lemon, while Joy wants to win at a science fair. While Earl is busy planning a Halloween party for Dodge and Earl Jr., Randy befriends Catalina's visiting nephew and discovers that the child may be capable of conjuring some dark magic. Jaime Pressly and Eddie Steeples also star. Earl finds out that he is no longer covered by the criminal code of ethics when someone steals Randy's birthday present from him. When he learns that the law of the underworld no longer protects him, Earl struggles with the idea of going to the police, despite Joy's protests that snitches are the lowest of the low. To cross Jerry off his list, Earl can't just return the RV he stole, mostly because Randy blew it up. Earl and Randy set out to find what might make this grumpy war hero happy, and accidentally turn him into a 75-year-old killing machine. Elsewhere, Joy and Darnell attempt to turn the legend of a giant pig that lives near the trailer park into a one-of-a-kind, money making sideshow. Earl's attempt to give Joy the hot tub she's always wanted backfires and she is forced to stay in a makeshift bubble because of a flesh eating toe infection. While she is out of commission, Earl must fill in as the new Joy. Between gossiping with the ladies at the salon and shopping for meat out of some guy's trunk, Earl learns a lot about the Turner family. This includes the fact that Dodge and Earl Jr. might have a social disorder that causes them to have no friends. Earl and Randy decide it's time to make amends with their childhood neighbors, the Clarks. But when they discover more skeletons in the closet than they had expected, the brothers find themselves needing to sort out some family issues between their mom and dad.Meanwhile, Joy has duped one-eyed Willy out of his glass eye, and despite Darnell's efforts Willy may never "see" that eye again. When Joy cons Make-A-Wish to send a celebrity to her trailer, Earl remembers a wish he stole from a dying child and decides it's time to cross him off the list. When he returns to the kid's home, he finds that little Buddy has exceeded all of the doctors' expectations and is still alive. Buddy asks Earl to produce his movie and suddenly all of Camden County find themselves starring in a high-octane action film. Randy surprises everyone when his acting skills get rave reviews. Resenting the fact that Earl spends more time with his list than with her, Billie tries to get his attention by undoing all his good deeds; and she ends up hiding out with a strict Amish sect, with surprising results. Earl seeks out romantic counseling from his friends as troubles ensues in Earl's karma-driven relationship with Billie. Earl's way of dealing with the situation is to spend all his time working on his list, which irks Billie even more since he no longer has time for her. Now that Billie and Earl are romantically involved, Earl convinces her to create her own karma list, which includes a grocery bagger in which is now down and out due to her thieving ways. Now that Earl has awaken from his coma, he sets out to find the most important thing in his life...Billie. Meanwhile, since their trailer has been deemed unlivable, Joy and Darnell move into The Crab Shack. With Earl still in a coma, Randy and Joy decide to continue crossing items off Earls list to improve his recovery. Earls parents went on a vacation and left the house to Earl and Randy. Upon returning early from the airport due to a flight delay they found a duffel bag full of marijuana in the house. Carl, Earls dad, is very mad and destroys all of it. Only to find Earl, Joy and Randy return home with an angry drug dealer holding a gun demanding his entire duffel bag full of weed back. Carl, reluctantly, was left with no other decision than to buy back all the marijuana from the local drug dealer, Circus. What will Randy do to amend this situation? Or is this a task that Earl can resolve just by listening to his father? Earl, upset over the warden reneging on his promise of an early release, plans an escape with help of the gang. After helping the Warden out with numerous tasks, Earl has discovered that his sentence has been deducted to six months left in jail. However, the Warden is now faced in a major dilemma and needs Earl's help. He promises Earl six months off his sentence if he will help him start a program that will mediate a situation between an inmate and their victim. Earl decides on an inmate who was in for running a meth lab that eventually burned his parent's house down. The inmate agreed to comply if Earl would throw a prison prom, because he missed his in high school. Earl turns to Joy to help plan the prom and soon discovers it will cost him the rest of the money he had left from his lottery winnings. Will Earl solve the problem and earn his freedom? Joy demands Darnell do something to help speed up the birth of the baby. Meanwhile, escapee Frank is determined to collect his hidden money, and Catalina is left in charge of Joy's children. The Warden asks Earl to take on a task of forming a skit called, "Scared Straight" that will scare kids from committing crimes and stay out of jail. The Warden asks Earl to incorporate environmental friendly "green" messages into his presentation, based off a request from his wife, the governor. Meanwhile, Randy gets into a fight with Earl about who is in charge between the two of them, and uses his guard privileges to make Earl's life difficult. While enjoying TV time in prison, Earl and Randy are excited when they see that the show "Cops" is filming in Camden County. The episode features different types of altercations that are all somehow related to Earl. Kenny is featured in the episode as a raffle winner who gets to ride along with a cop. Since the "Cops" episode was taped prior to Kenny and Earl's reconciliation, Kenny shows resentment towards Earl. With karma back on his side, Earl is approached by the jail warden to help resolve one of the biggest problems going on in the jail yard. There are feuding gangs constantly breaking out into fights, and Earl is asked to resolve these gangs' differences. If he is able to settle this conflict, he will receive a lesser sentence. Earl accepts the task and finds out a lot more than he bargained for. Meanwhile, Randy is still suffering from Earl withdrawals and continues to search for ways to be reunited with his brother. As Earl continues to cope with his new life behind bars, Joy, after several failed attempts, finally finds a way to pay Earl back -- she decides to take care of Randy for him. Meanwhile, Randy has difficulty adjusting to life without Earl and Earl is sought out by a prison bully. The actress shared a belly-baring photo in honor of her 40th. The 'My Name Is Earl' star is going to be a mom again, twice. Jaime Pressly must have been celebrating the New Year a little too much this week. Maybe she didn’t know the party ended on Saturday! Jaime, who starred in My Name is Earl, was arrested for suspicion of being intoxicated while driving in California. Jaime is not new to the party scene. Remember when she was supposedly caught urinating in public, on VIDEO! She denied it and said it was a water bottle being emptied near the ground. My Name is Earl is currently available to watch and stream on NBC. You can also buy, rent My Name is Earl on demand at Amazon, Hulu, Vudu, FandangoNow, Google Play, iTunes online.